An online community for food lovers, The Recipez is capable of turning even those who have a very limited culinary awareness into people who were born to wear chef hats. And it’s also sure to make you feel hungry, even minutes after having had brunch, I can tell you. It brings together so many recipes (and highly-detailed photos to go with these) that no person who visits it could fail to have a more developed understanding of cuisine at the end of it all. And what good is a community without discussions? 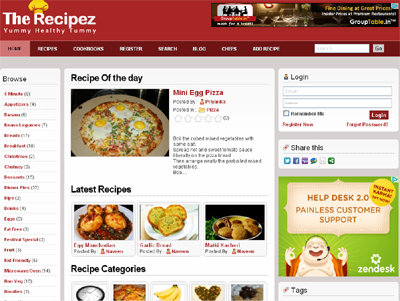 Those who join The Recipez are allowed to rate all the dishes that are featured on the site, and also to make any remark that they think could add some seasoning to what others have chosen to share.